''When I first heard that the SUG elections were not going to hold on the 12th, I thought it was a joke! I wondered: "Is the SUG now like a piece in the game of Chess where the Management can change the positions of these pieces at will?" Before long, it came that it was on the 13th. And right now, nobody knows where the Management will drop this PUPPET SUG in this chessboard of UNIBEN!! 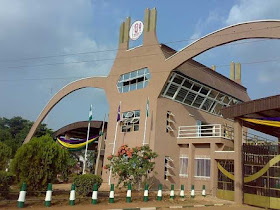 Worst of all, students are watching silently because: "The fear of losing your certificate is the begining of knowledge and wisdom in Uniben." It is obviously that the students Union now is now like a grasshopper in the hand of the wanton boy ( school management) and can be controlled at their own Caprice... Even at our own detriment... My brother am afraid were our hope lies. """"Na so they go continue till after Edo state election... Next you will see them institute their puppets as interim/caretaker commitee. Through those ones, they (Profs) will penetrate the government under the canopy of SU, after all if you talk, they will #change you"""
""Maybe the next SUG election will be held when I'm serving as a corps member.""" ''Na wa uniben and the bent election mystery which no one understand "
Uniben Gist will bring you more updates..